The objective of the research project Polytos is to develop printed organic circuits with integrated sensors capable of recording data such as temperature, humidity or light exposure. 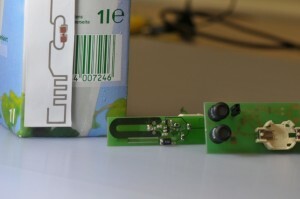 The deployment of these types of printed organic circuits for item-level-tagging in logistics or supply chain scenarios could be used as organic printed smart labels in the future. In this project we are researching on highly scalable communication protocols, which will be capable to read out the sensory information from more than 1000 labeled items in a short time frame. Intelligent Environments are currently mostly implemented with WSN technologies using conventional connection-based communications. However, connection-based communications may impede progress towards intelligent environments involving massive amounts of sensor nodes. The goal of this paper is to chart a field of more suitable technologies for communication in intelligent environments, which we call collective transmission methods. The idea of collective transmission is to establish communication not between single senders and single receivers but between collectives of senders and receivers, by making use of constructive interference of simultaneously sent signals. We detail how the collective transmission approach can be realized for a concrete application scenario: item-level tagging using printed organic electronics. We describe an algorithm that can be realized on very simple tags. With a testbed implementation, we show that this algorithm can realize robust, collective, approximate read-out of 21 simultaneously sent signals.